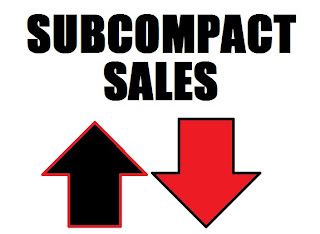 March proved to be a mixed bag for subcompacts. The Kia Rio proved to be the biggest seller, with sales up more than 117%. The mechanical twin, the Hyundai Accent, also sold well, as did the Nissan Versa, Kia Soul, Suzuki SX4, and Toyota Yaris. The Juke was up slightly, too. The biggest loser, yet again, was the lowly Nissan Cube; its sales down more than 69% from last year. The Mazda2 stumbled this month, but is still up healthily for 2012. In terms of YTD sales, Nissan's Versa is still at the top. MINI's Cooper/S Convertible—a niche vehicle—sold the fewest units. It should be noted that Chevrolet's Sonic is selling quite well for its first year. Also, Fiat moved quite a few 500s in March, too. With the recent spike in gas prices, I wouldn't be surprised to see numbers up in the next couple of months, however. Onto the big board!